This post is the first in a mini-blog series that I’ll be writing, which will focus on some of the great things that are happening because of new contract language won during the last round of bargaining in 2015. 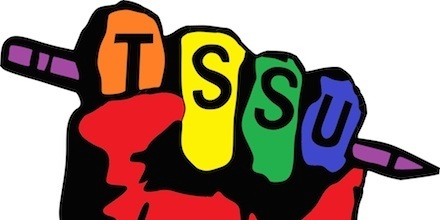 The Collective Agreement will be up for negotiation again in Spring 2019, so if you have ideas about other changes that should be made and want to make your voice heard, make sure to fill out the TSSU 2019 Bargaining Survey! More information is available at http://www.tssu.ca/2018/05/31/the-tssu-2019-bargaining-survey-is-now-available/. One of the most significant wins during the last round of bargaining was that sessional instructors now have a seniority system in place that gives them more security in their jobs and the opportunity for advancement to longer term positions. In the old collective agreement, sessional instructors had no seniority rights other than what is called “Right of First Refusal”- which essentially meant that if a sessional had taught a certain course for 3 semesters in a row (or for 5 semesters within 3 years and 3 times within the last 9 semesters), they would be given priority to teach that course. However, once that right had been used three times, that right was lost, and they would revert to having no seniority. Not only was this system confusing and unfair, but the sessional instructor was responsible for keeping track of this priority themselves and making it known to their department that they have priority for that course in order to use that right. Sessional instructors are a key component of the teaching community- sessionals and other on-contract instructors are estimated to be responsible for teaching over 50% of all Canadian undergraduate classes. Often, they put in much longer hours than a faculty member with the same course load would be expected to, as they are not always given teaching assistants to help with marking and running tutorials. This, combined with the added pressure of re-applying for sessional positions every semester, causes undue stress for sessional instructors, which is why the new language in the Collective Agreement is so important! The new Collective Agreement states that anyone who has taught 16 courses at SFU within 4 years will be offered limited-term lecturer positions with a minimum duration of 1 year. The TSSU is very happy to report that this means that by Fall 2018, 29 sessional instructors will have received offers for limited-term lecture positions! This will give a 25% pay raise and more job certainty to sessional instructors who have already proven their teaching abilities to SFU by being continually re-hired.